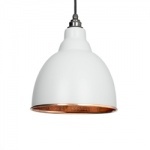 Our Pendants come in four distinctive shapes and several different finishes The lights can be used to transform lots of spaces. 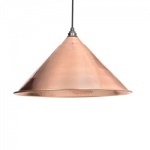 Our Pendants are hand spun from solid steel & finished in copper or nickel. They really have a quality finish, there are cheaper versions out there but in our opinion these are very well made. 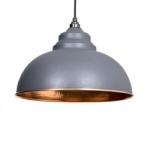 Each light is handmade to order and we are more than happy to create bespoke colours and finishes if required. Please keep in mind that due to handmade nature of these lights, they're on a 2 week leadtime from point of order.